What’s up with the People’s Daily? What the heck is going on at the People’s Daily? This is what many Chinese readers have been asking since the official Party “mouthpiece” (喉舌) — that’s CCP parlance, not a slur — started running a recent series of editorials calling for “tolerance” and “reason,” and speaking out against the “null expression” of China’s masses who cannot get their legitimate voices heard. From a newspaper that rarely if ever makes for interesting reading, the editorials seem a rare surprise. As I mentioned yesterday, even relative insiders who generally know how to read the signs have scratched their heads. After reading yesterday’s piece on the need to make all voices in China heard, through grievance resolution as well as expression itself, the Chinese user “freemoren” wrote on Twitter: “Doesn’t the People’s Daily seem not to be itself lately? What’s up with Comrade Li Changchun?” The reference to Li, the fifth-ranking member of the politburo standing committee and China’s de facto propaganda chief, suggests these editorials point to turmoil within the media policy ranks. So, what the heck is going on at the People’s Daily? It’s no secret, of course, that the People’s Daily isn’t a paper for the people at all. And the surest sign of the paper’s irrelevance to the hoi polloi — much like other Party newspapers at the provincial and municipal level — is its sinking circulation numbers relative to the country’s new brand of commercial newspapers, the likes of The Beijing News, Xiaoxiang Morning Post and Southern Metropolis Daily. But while the Party’s official mouthpiece is not exactly a joy read — and arguably deserves much of the contempt it is shown inside and outside China — there is often more to the People’s Daily than meets the eye. That, mind you, is a statement of fact, not subjective praise. One of the most basic mistakes you can make in reading the People’s Daily — and China’s political terrain generally — is to assume that the Party’s official mouthpiece necessarily reflects a unified, sanitized and tightly managed picture of thought and action at the very top. There are a couple of basic points to understand. First, even in the proverbial best of times for China’s internal Party politics, pieces in the People’s Daily can reflect agendas or views that are not necessarily unambiguous Party mandate. What I mean to say is that even while it can be completely accurate to say that editorial “X” represents a Party viewpoint, you still must ask the question: whose Party viewpoint? We know that pieces appear regularly, daily, in the People’s Daily under pen names that stand in for various Party and government offices — which is sometimes also to say interests. The “Zhong Jiwen” editorial this week from the Central Discipline Inspection Commission is a perfect example of this. And let’s not forget the stink bomb that went off at Sohu.com in November last year (though very briefly) over who was behind the pen name “Zheng Qingyuan” (郑青原) put to a series of harder-than-hardline editorials in the People’s Daily, which also outed a number of official pen names. So is it more accurate to see the People’s Daily as an unclouded reflection of Party doctrine and consensus, or as a gumbo pot of subtly competing Party ideas and agendas? . . . No doubt, it falls somewhere along the spectrum between these, and may shift in either direction depending upon the prevailing political winds. I’ve written at some length here, here, here, here, here and also here about what seem to be deepening divisions within the Party, between left and right, hardliners, liberals and moderates. Upcoming leadership changes in 2012 are of course an issue, but so is the larger question of deep social, economic and political challenges now facing China — and how exactly to tackle those. An insider at the People’s Daily has emphasized, against suggestions that this series was somehow a cynical propaganda ploy, that these editorials were an “independent” action on the part of the editorial department at the newspaper — meaning that editors at the paper planned and executed the series, but of course had backing from unspecified senior leaders. That doesn’t, of course, mean real and true “independence,” but suggests that these editors (and those supporting them politically) are actively taking advantage of gaps within the Party and the paper. These editorials should be read as a concerted push by moderate voices within the Party against the (seemingly ascendant) extreme wing (极端派) or “hardline wing” (强硬派) of the Party. These latter elements in the Party, which I’ve heard Chinese journalists refer to also as the “stability preservation clique,” or weiwenpai (维稳派), seem to be running the show right now in terms of “social management” (社会管理). They are the commanders, if you will, of what liberal scholar Yu Jianrong (于建嵘) has called “rigid stability,” essentially the mobilization of a vast police and surveillance apparatus to deal with rising social unrest. And they are the driving force behind the assault on political dissidents, lawyers and activists in recent months. The actions of this “faction”, a term I use very loosely, are opposed not only by a many ordinary Chinese, but also by many within the Chinese Communist Party and by many Party journalists. The recent editorials in the People’s Daily are crafted in opposition, you might say, to China’s hardline turn. They represent not necessarily “liberals” but rather what you might characterize as “moderates” within the Party. 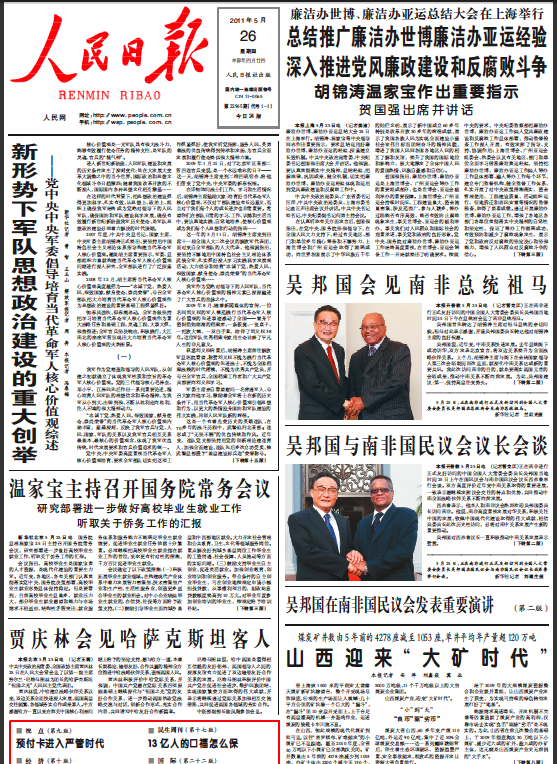 Despite the People’s Daily‘s status as the “mouthpiece” of the CCP leadership, it is completely possible to have pieces representing “hardline” Party views and “moderate” Party views within the same edition of the newspaper. So there is in fact no need to posit a psychological split here — “This newspaper is suffering from a serious split personality!” — but only a political one, or several. Which brings us to our second basic point. And that is that rifts have historically played out in the pages of the People’s Daily, particularly at times when divisions are deepened within the Party. One of the best examples was a front page editorial appearing in the November 14, 1979, edition of the People’s Daily, called “We Can Talk About Political Issues Too” (政治问题也可以讨论). This moderate editorial appeared against the backdrop of internal Party division over the so-called Democracy Wall protests (1978-1979) and the arrest of activist Wei Jingsheng (魏京生). Parallels with the case of artist Ai Weiwei (艾未未) are tempting, but probably best avoided. That year, on November 14, the People’s Daily printed an article by Guo Luoji (郭罗基) called ‘We can talk about political problems too’, examining and elucidating the principles of “don’t shoot the messenger” and “speech is not a crime”. Some people believed these articles spoke on behalf of Wei Jingsheng, and they lined up to criticise the People’s Daily. Hu Qiaomu was greatly incensed by it, complaining to Deng Xiaoping that the paper had flagrantly excused Wei of his crimes. This began a dispute between Hu Qiaomu and I. With no basis at all, he accused us of completely affirming the innocence of counterrevolutionary political opinions, and demanded to know why I had published this kind of important article without sending it to the central government for examination. In fact, the article had been reviewed and edited by Yaobang. Not wanting to pull him into this whirlpool of discord, I replied that the People’s Daily had the right to publish this kind of article without running it past the censors. Afterwards I consulted Yaobang, who specially arranged several legal experts to come and talk it over. They said Guo’s article was not particularly wrong, but that his thesis was not complete enough as it had not explained that freedom of speech was also restricted by the law. Forthwith they wrote an article for the People’s Daily called ‘Discussing the speech and behaviour problem within counterrevolutionary crimes’, reaffirming “don’t shoot the messenger” and explaining Article 102 of the Criminal Code, “the crime of counterrevolutionary incitement”, and the principles behind it. The face-off between Hu Jiwei and the hardline Hu Qiaomu (胡乔木) is an oft-cited illustration of political divisions within the Party over reform in the 1980s, and the impact this had on press policy in particular. Undoubtedly, the comparison could be taken too far, but it does serve to illustrate the ways in which the newspaper we so often revile as the “mouthpiece” of narrow political accord can illustrate discord as well.